One of the biggest problems in relation to infrastructure development or construction projects in Indonesia is the land acquisition process. Many projects have been delayed - or cancelled altogether - because local land owners refuse to sell their land to the developers of the project, or, they only agree to sell land at very costly prices. However, it is more complicated than that. Due to weak governance and Indonesians' low awareness of land registration, there often occurs uncertainty about land ownership (sometimes multiple parties claim to be the true land owner). Another scenario that often happens is that certain people - as soon as they learn a big project will be developed - purchase land in that area with the purpose of selling it at steep prices to the developers of the project. One of the many projects that is plagued by land acquisition turmoil is the Jakarta-Bandung high-speed railway project, one of the projects that is supported by Indonesian President Joko Widodo in his quest to boost infrastructure development across Indonesia in a bid to improve connectivity and reduce logistics costs. This Jakarta-Bandung railway project, often labeled Indonesia's first-ever high-speed railway project, will connect Indonesia's capital city of Jakarta to the city of Bandung in West Java through a 142.3 kilometers-long railway. The USD $5.1 billion project is developed by Chinese-Indonesian consortium Kereta Cepat Indonesia China (KCIC). About 75 percent of costs are financed by the China Development Bank. The remaining 25 percent is funded by the consortium. KCIC was granted a 50-year concession period that will commence on 31 May 2019 when the high-speed railway is scheduled to become operational (although there are serious concerns whether this target can be achieved). Developers expect to require 40 years to reach the break even point. Trains between Jakarta and Bandung are estimated to be able to carry up to 29,000 passengers per day, with ticket prices expected at IDR 200,000 (approx. USD $15.4) per passenger. Trains will be able to reach a maximum speed of 250 kilometers per hour. 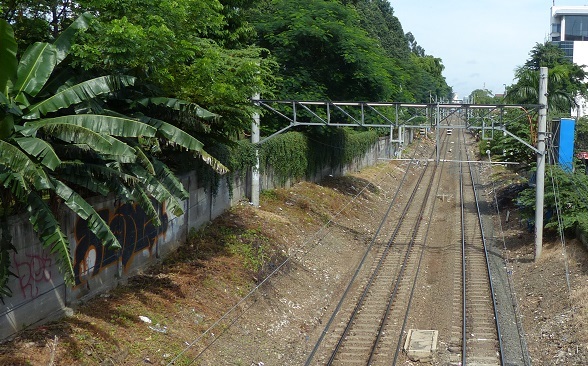 In local media it is reported that Indonesian Vice President Jusuf Kalla and Indonesian Transportation Minister Budi Karya Sumadi agreed that the land acquisition obstacle cannot be solved and therefore existing lines will be used for the Jakarta-Bandung high-speed railway project. This would mean the cost of building the project also declines as no new stations need to be constructed. However, the existing track does need a great upgrade, especially the hundreds of road crossings, because the existing tracks can only handle trains with a maximum speed of 150 kilometers per hour (a speed that is rarely achieved because of the hundreds of road crossings). Possibly there need to come elevated tracks to make the railway more efficient. Although the groundbreaking ceremony was held in January 2016, construction of the railway had to be postponed due to issues related to paperwork (the operational and construction permits still had to be issued) as well as the revisions that had to be made to the project's development plan. KCIC secured a concession for the project in April 2016, but it was unable to start construction because only half of the required land was cleared.